Hadrian’s Wall from the Air. Hadrian’s Wall is Britain’s premier and most visited Roman monument and is now recognised as a World Heritage site. The archaeological remains are the best preserved and most intensely studied of their kind anywhere, and much has been written at academic and popular levels. Until now, however, there has not been a book on the substantial contribution made to Wall studies by air photography. Yet aerial reconnaissance has become the single most important technique by which new archaeological sites are found and on the Wall it has provided an entirely new perspective that cannot be appreciated on the ground. 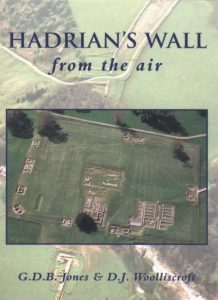 In chapters on the pre-Wall Stanegate frontier, the history and development of Hadrian’s Wall itself and the outposts and coastal defences, the authors show a far more complex and fascinating history than has been traditionally envisaged, illuminated by over 120 superb photographs and maps, many in full colour. The ingenuity and technology of the ancient world never cease to surprise and signalling demonstrates both to the full. There has, however, never been a study of signalling in English, not has anyone previously tried to operate the techniques described in the classical manuals. David Woolliscroft’s study is in two parts: first he describes the signalling techniques pioneered by the Greeks and developed by the Romans; then he looks at the application of these principles to Hadrian’s Wall and the German Limes, as revealed by archaeological research. In each case he finds that despite difficult terrain, the layout allows nearly all of the small observation posts to see, and thus signal to, one of the main garrison forts. Since on occasion this caused marked tactical weaknesses in the line, it is clear that signalling was given a high priority by the frontier designers. Similar results are now being found elsewhere in the Roman world, suggesting that all Rome’s very different looking frontier systems may have an underlying uniformity. 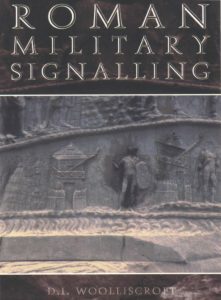 With 80 illustrations and complete with an Appendix containing all of the key classical references to signalling, this is a study that will be indispensable for anyone seriously interested in the Roman army or in frontier studies. An interim report on the Roman Gask Project 1995-2000. BAR British Series 335. David John Woolliscroft et al. The Roman Gask project was founded in 1995 in the University of Manchester.It has since been engaged in an extensive campaign of surveys, excavation and archive work. Its remit was to cover all of Roman Scotland north of the Antonine Wall but, as its name suggests, its princAal focus has been on the system of military works on and around the Gask Ridge in Perthshire (from the Glenbank fortlet, north of Dunblane, to the fort of Bertha on the Tay). This volume is an interim report describing the progress made during its first five years. It is in two sections; the first provides an overview of the current state of knowledge on the Gask, while the second section reports on a series of field work programmes (two rescued from archives dating from the 1960s and 1970s. The project has undertaken nineteen excavations, numerous surveys, museum/archive work, air-photography assignments, and field-walking tasks: a significant achievement over a short period of time. Hadrian’s Wall and the Antonine Wall are Britain’s best-known Roman frontiers but a more northerly line is also known, on and around the Gask Ridge in Perthshire, which seems to represent the earliest fortified land frontier anywhere in the Roman Empire. Research over the last 10 years has revealed more and more about this system. In the process, it has revolutionised our picture of the Roman occupation of the north of Scotland, which now seems likely to have begun well before the time of the famous governor Agricola. Moreover, the Roman remains can now be set more firmly in the context of the pre-existing Iron Age society, to produce a more peaceful picture than expected. 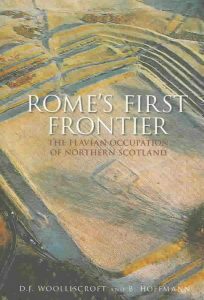 This detailed account, by two scholars intimately associated with the latest research, provides an up-to-date and detailed, yet approachable, account of these early years of the Romans in Scotland. 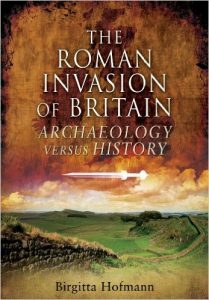 The purpose of this book is to take what we think we know about the Roman Conquest of Britain from historical sources, and compare it with the archaeological evidence, which is often contradictory. Archaeologists and historians all too often work in complete isolation from each other and this book hopes to show the dangers of neglecting either form of evidence. In the process it challenges much received wisdom about the history of Roman Britain. Birgitta Hoffmann tackles the subject by taking a number of major events or episodes (such as Caesar’s incursions, Claudius’ invasion, Boudicca’s revolt), presenting the accepted narrative as derived from historical sources, and then presenting the archaeological evidence for the same. The result of this innovative approach is a book full of surprising and controversial conclusions that will appeal to the general reader as well as those studying or teaching courses on ancient history or archaeology.